eight − 1 = Required Please enter the correct value. Charlie Munger, Warren Buffett's longtime investing and business partner, said that teaching young people how to trade stocks is like starting them on heroin. Yes, you read that right. One of the most famous – and most successful – stock pickers in the world likened stock trading to a heroin addiction. 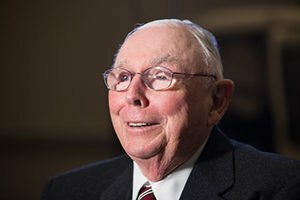 "If you take the modern world where people are trying to teach you to come in and trade actively in stocks, well I regard that as roughly equivalent to trying to induce a bunch of young people to start off on heroin," said Munger. Well, the thrill of victory certainly is intoxicating. But we couldn't disagree with Munger more. Frankly, we don't think he agrees with his own advice, considering the billion-dollar fortune he's amassed from buying stocks. While you shouldn't be in stocks for the thrill, you absolutely need to be if your goal is the long-term accumulation of wealth. Active investing is the key to building wealth – real wealth – so you can live the life you want, whether you are retired or still working. Instead, Munger recommends investors gain exposure to stocks through index funds. There is an argument for that because many stock pickers, including professional money managers, tend to lag behind the market in performance. The legendary John Bogle, the late founder of the Vanguard Group and inventor of the index fund, built an industry on just that fact. Now, paying a massive fee to professional money managers just to get average market returns doesn't make much sense. But beating the market is possible. And you'll need to do it if you want to meet your long-term retirement goals. While long-term wealth building should be the core of your investing philosophy, we believe a combination of both trading and investing can help you reach your goals. If you do it correctly and strategically, you will be able to make money in any market. Active investing is the key to building wealth, but usually only for your broker and definitely not for the individual an investor. Morningstar did a study to determine which factors are most predictive of mutual fund managers performance. They were only able to find two. Funds with low fees and low portfolio turnover were more likely to produce better returns for their investors. Is beating the market possible? Yes, absolutely. Is beating the market through active trading likely? No, not at all. Check the long term results of the data from Standard and Poor Indices Versus Active investment managers (SPIVA.) Compare the performance of active funds with the performance of their benchmark indices and make your own decision. The person writing this article obviously doesn't know the difference between active trading and investing. Munger couldn't be more right!